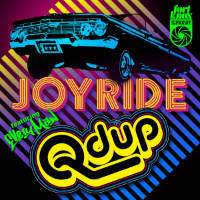 QDup and EVeryman provide a new theme for driving down PCH top down and hands in the air like you just don’t care by way of Joyride. It’s a catchy P-Funk-inspired breaks tune with crisp drums, farty synth bass, EVeryman knocking out the verses and QDup himself on the talkbox for those authentic frequency-bending hooks. Should have your lowrider popping. Comes complete with instro and dub mixes too. 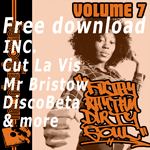 Free download breaks ghetto funk psych Dirty Dubsters Basement Freaks Renegades Of Jazz Fort Knox Recordings Rory Hoy Badboe Record Kicks Ewan Hoozami latin Funk BBP video Morlack Tramp Records Chart Fort Knox Five reggae nufunk Smoove The Allergies trip hop Mr Bristow Jazz Breakbeat Paradise glitch-hop Soul Bulabeats Electro swing disco Jalapeno Records Remix vinyl 7" hip-hop review vinyl 7"